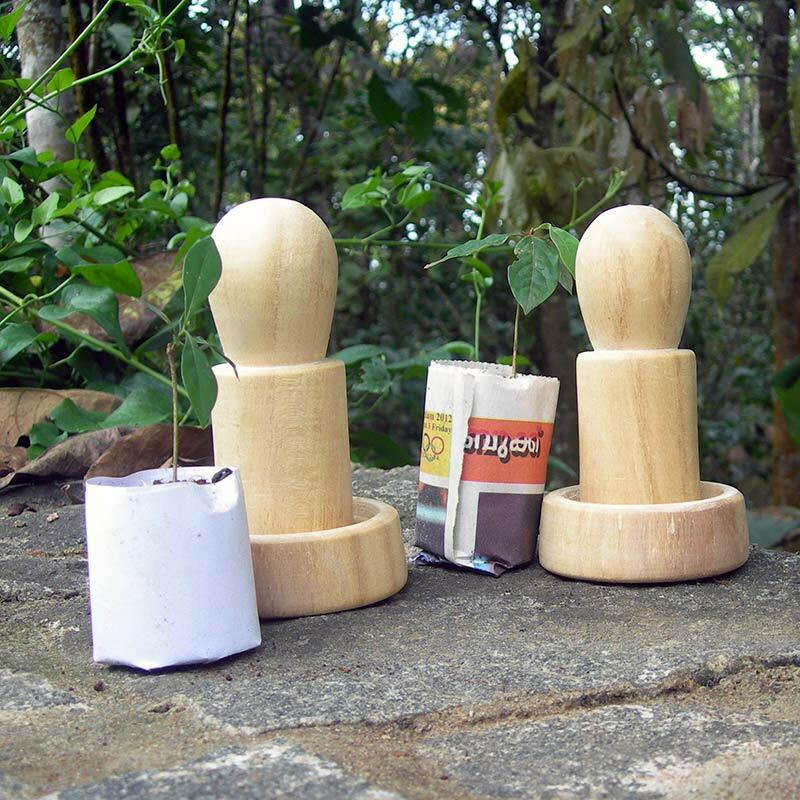 The paper potter is a brilliant tool for making environmentally friendly, bio-degradeable seedpots from newspaper. As no plastic is used, the seedlings can be transplanted in the pots, which has the added advantage that the sensitive roots of delicate seedlings are not disturbed during transplantation. Material: The paper potter consists of a handle and a base made from Gmelina-arborea. This is a fast growing, short lifespan plantation tree that has very low absorption of CO2. It is, therefore, a reasonably sustainable wood source. Dimensions: The base has a diameter of 7.5 cm and a height of 3 cm. The handle has a diameter of 4.5 cm and a height of 11 cm. When joined the total height is 13 cm. As this is a handmade product, the measurements may vary by up to 0.5 cm. Instructions: First, cut strips of newspaper sized 57 cm by 8 cm. Second, roll the paper strip loosely around the handle; if the rolling is too tight, it is difficult to remove the pot from the handle. Third, fold excess paper under the bottom of the handle. Fourth, press the bottom of the handle into the base, and twist the handle two to three times. If your newspaper supply is of low quality, i.e. it is not holding its shape well, use strips of newspaper sized 57 cm by 16 cm, and fold the paper lengthways. Other types of paper, e.g. old A3 or A5, are also useful. Stock and delivery: There is a finite number of these potters in stock. These are the only ones, and no further stock will be available. Quality: The potters are by no means aesthetically perfect as the surface finishing is marked in places, but they are fully functional, and should last a lifetime.